Adapted from Amy Pollien’s Röschti. 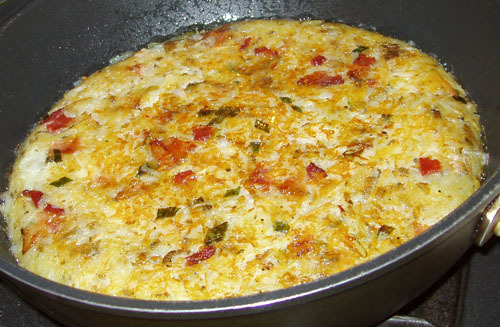 In a large mixing bowl, gently mix shredded potatoes, cheese, scallions and bacon. Heat 1 Tbsp of oil and 2 Tbsp butter (or more) in a large and deep cast iron or nonstick pan on medium heat. Add the entire contents of your mixing bowl and press down firmly with a spatula. Cook uncovered on medium-low heat for 12-15 minutes. Flip “out” your Röschti onto a plate or platter. Add another Tbsp of oil and 2 more Tbsp butter (or more) to the pan. Slide your Röschti back into the pan, uncooked side down. Press firmly and cook uncovered for another 12-15 minutes. I quartered and boiled my potatoes for about 10 minutes, then cooled them for 30 minutes before trying to shred them. It wasn’t so bad. I strongly encourage you to read Amy’s post instead of following my directions. 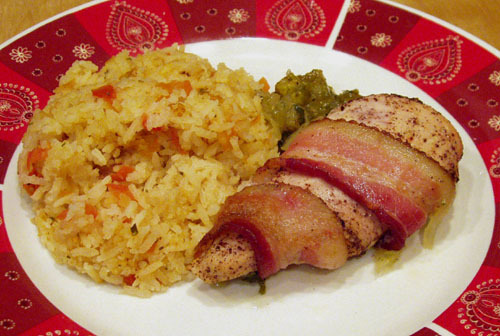 Bacon wrapped around chipotle lime chicken, with rice and salsa. Oops, forgot my beans! 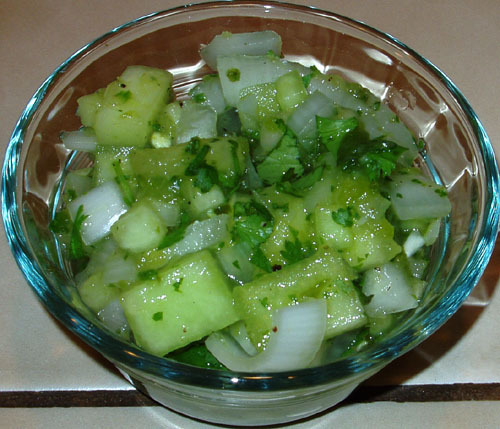 Combine chipotle, oil and lime juice in a bowl or plastic bag. Add chicken breast halves and coat well. Set aside. In a lightly greased baking dish, spread out the salsa evenly. Wrap bacon slices around chicken breast halves and place on top of salsa. Bake uncovered at 400 for 30 minutes or until the juices run clear. Seen here served with Elise’s Spanish Rice and honeydew salsa. Adapted from the back of the jar. I did pulled pork sandwiches again; added a pound of pork and 1 cup of water and let it sit on high in my crock-pot all day. And, again, I had to boil it down to get rid of the extra water. This sauce is ready to dip as is, but it tastes better heated up, and it made for a pretty awesome sandwich. The Daring Cooks‘ October challenge of phở and dessert wontons comes from Jaden of the Steamy Kitchen. Combine the first 6 ingredients in a saucepan. If necessary, add enough water to almost reach the top of the fruit (I used 1/2 c, but it all depends on the width of your saucepan!). Bring to a boil, reduce heat and simmer covered for 30 minutes. Mix 2 Tbsp flour and 1/4 cup of water until most or all of the flour is dissolved. Slowly stir into fruit mix. Bring to a boil, reduce heat and simmer for 10-15 minutes, or until your compote feels slightly thick. Preheat oven to 350. 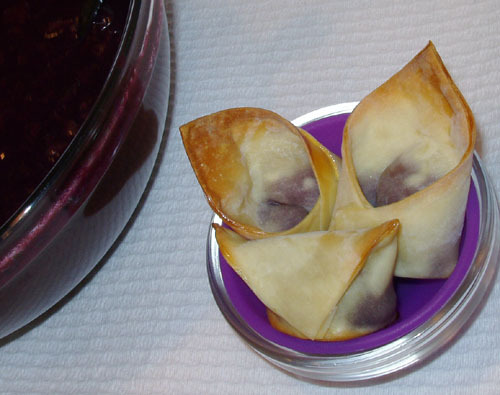 Place one teaspoon of compote in the center of your wonton wrapper. Sprinkle compote with flour. Fold creatively, and use the whisked egg to seal them shut. Baste the folded wonton with melted butter. Bake at 350 for 13 minutes or until golden brown. I used my cupcake tin because I wasn’t sure of any possible explosions that might occur. 🙂 I could have probably used my cookie sheet and done 30 at a time instead of just 12. My grapes were Concord grapes. I’m not really interested in revealing how many hours it took me to remove the seeds from four very large bushels of grapes. Let’s just say I’ll never do it again, and I don’t recommend you do it, either. #^_^# Just use seedless grapes or another type of fruit. Yes, I’ve left out my version of phở, intentionally, based on a personal view that the internet is an oyster from which anyone may slurp the succulent meat. Total time: Approximately 40 minutes, plus rice or pasta cook time. Heat oil on medium heat, add garlic and ginger, heat through. Add onions and cook until clear (about 5 minutes). 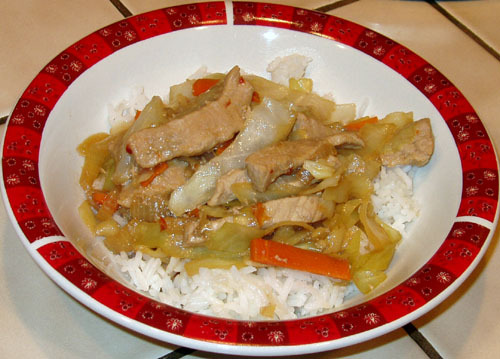 Add pork and cook through (5-10 minutes depending on the thickness of your pieces). Add tamarind and sambal oelek and coat everything thoroughly. Add carrots and cook one more minute. Place cabbage evenly across the top of the pan. Cover tightly and simmer 10-15 minutes (depending on how crisp you want the cabbage to be). Mix well and serve. I could pass this off as a Thai stir fry. Easy.